李斌雄, 张银霞. 中共十八大以来强化党内监督的新发展[J]. 北京航空航天大学学报(社会科学版), 2018, 31(2): 38-46. LI Binxiong, ZHANG Yinxia. New Development of Strengthening Inner-Party Supervision Since the Eighteenth National Congress of the Communist Party of China[J]. Journal of Beijing University of Aeronautics and Astronautics Social Sciences Edition, 2018, 31(2): 38-46. Abstract: Strengthening the inner-Party supervision is the guarantee of comprehensively strengthening Party discipline. 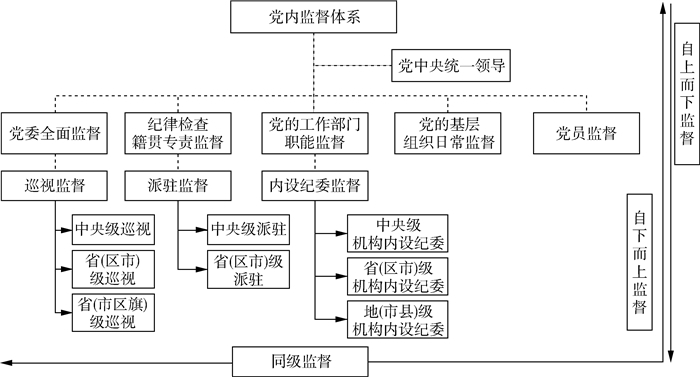 Since the Eighteenth National Congress of the Communist Party of China, based on the theory and practice of inner-Party supervision in the process of revolution, construction and reform, the Communist Party of China (CPC) has further strengthened the inner-Party supervision and optimized the supervision network, system and structure. Starting from its top design, the CPC strengthens the inner-party supervision by taking full advantage of traditional supervision and strengthening inspection-tour and stationed supervision; by focusing on accountability of supervision and discipline execution so as to explore new forms of effective supervision; as well as by amplifying the institution to complete laws and regulations of the inner-Party supervision. The CPC also optimizes the supervision system so as to realize the overall coverage of the inner-Party supervision by building a tight supervision network, balancing and collaborating all kinds of supervision powers, laying emphasis on the combination of the supervision both inside and outside the Party, intensifying top-down supervision, emphasizing counterparts supervision, promoting down-top supervision and transforming a full-time supervision over a point to a cooperated supervision over a scope. After four years' practice, the inner-Party supervision network has been basically constructed into an associated dynamic crisscross structure of overall coverage at all time and all levels. However, prominent problems still exist in the inner-party supervision, such as interruption of relay between each other, poor overall performance. Therefore, it is suggested that emphasis be put on playing superimposed effects of various supervision methods to realize the maximum supervision effect. 中共中央马克思恩格斯列宁斯大林著作编译局. 马克思恩格斯全集:第4卷[M]. 北京: 人民出版社, 1958, 572-577. 列宁. 列宁全集:第43卷[M]. 北京: 人民出版社, 1987, 374-377. 邓小平. 邓小平文选:第1-3卷[M]. 北京: 人民出版社, 1995. 中共中央政策研究室, 中央文献研究室. 江泽民论加强和改进执政党的建设:专题摘编[M]. 北京: 中央文献出版社, 2004, 257. 江泽民. 在中国共产党第十四次全国代表大会上的报告[M]. 北京: 人民出版社, 1992, 10. 周淑真. 新一轮巡视监督的五大特点和风格[J]. 当代社科视野, 2014(5): 31. 中共中央文献研究室. 十三大以来重要文献选编:中[M]. 北京: 中央文献出版社, 2011, 338. 中共中央文献研究室. 建国以来重要文献选编:第15册[M]. 北京: 中央文献出版社, 2011, 484. 中共中央文献研究室. 十二大以来重要文献选编:上[M]. 北京: 中央文献出版社, 2011, 53. 中央办公厅法规室. 中国共产党党内法规选编[M]. 北京: 法律出版社, 1996, 638. 中央纪委法规室. 党风廉政建设和反腐败现行法规制度全书:第6卷[M]. 北京: 中国方正出版社, 2005, 7-8. 王岐山. 全面从严治党, 严明党的纪律, 把握运用监督执纪"四种形态"[N]. 中国纪检监察报, 2015-09-27(01).